I began collecting Walpole related books, postcards, ephemera and souvenirs four months before I completed my move to town in 2002. During my collecting (which will not cease) I have amassed probably the largest collection extant of different Walpole postcards (over 500), and I have every Walpole book, that I am aware, of in my library. The extensiveness of my collection lead to my sharing some of it in my book, AS IT WAS… AND STILL IS… WALPOLE, NEW HAMPSHIRE, which I published in 2014. My collection has also provided much material for my monthly “Did You Know That…” history articles in THE WALPOLE CLARION. Building a collection leads to having duplicates when other collections are purchased. In addition, I also purchase many items to “get them home.” The intent is again to share, and I have started this page of offer my duplicates with the hopes to add to your collection, or to help you get the “collecting bug” to discover “new” things yourself. All books happily shipped in the US for $4 Media Mail (I have been shipping books professionally for over 35 years). Overseas, please inquire for cost. I just spent a week reworking with my Walpole postcard collection. I had separated out the ones used in my book, and for Did You Know That… articles. It was time to bring everything back together to then assemble into albums for better viewing. 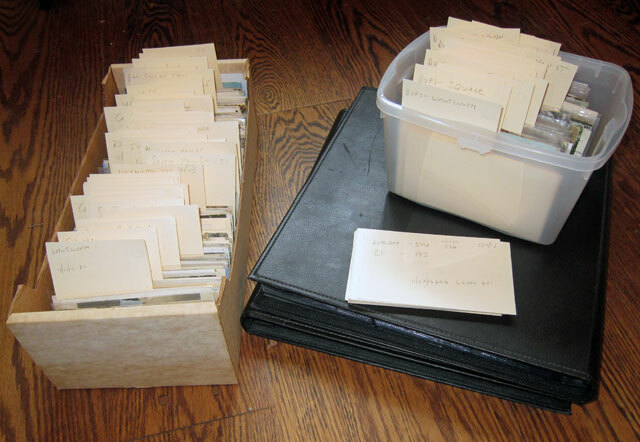 Having done that, as you can see below, I have a box of 546 different Walpole postcards (box on left below) ready to put into the black albums you see on the right. In the plastic tub on the albums are my 206 duplicate Walpole postcards – now for sale starting at $3. And, here are three samples of what I have for sale. I will try illustrating more, but feel free to contact me and come take a look through the cards for sale. I would love to start someone else (or several people) collecting these historical images. Quantity discount to help your collection get started. Photography was invented in 1839, and it was not much later that cameras were developed to take side by side images. The images were then mounted on card stock, and when viewed through either a hand-held viewer, or table top model, the eyes would see the picture in 3-D. Looking at steroeoviews became a popular parlor pastime, and families could tour the world, and enjoy local views while seated at home. With its heyday in the 1870s, stereo views, at the turn of the century, were replaced by the ubiquitous postcard album as the focal point in Victorian parlors. Walpole had at least two commercial photographers in town in the late 19th century. Warren P. Chapin was here in the late 1860s and early 1870s. Next in town with a photography business was Harvey Ball. Both produced stereo views of Walpole. The Keene firm of J. A. French also made stereographs of Walpole. I have 85 mounted stereo cards, of which 19 are duplicates (or triplicates). 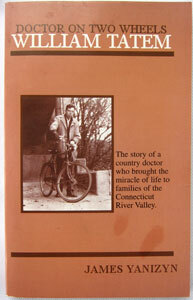 I have some that are not in the Historical Society archives, and they have some I do not have. I forget whether I have more, or they have more — but someday they will have mine to. But, I would like to share my extra cards. Feel free to come take a look. Prices range from $20 to $40. Here is a sample of views I have for sale. 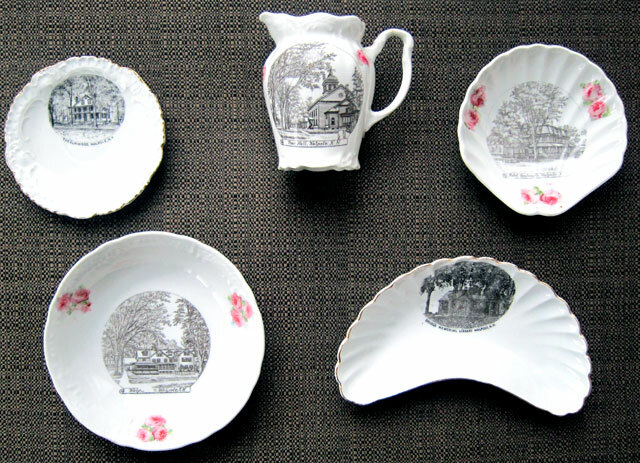 Extremely popular in the 19th century, prior to widespread use of photography, was the manufacture of souvenir china to be sold at resorts, attractions, towns – just about anywhere a merchant thought he could sell something for a tourist to take home as a memory. Souvenir China, usually made in England, had images “transferred” onto them in the process. Usually, as is the case with Walpole images, the same or similar image was used on many different patterns of china. Some pieces were utilitarian (bone dishes) and others purely decorative. Collecting ranges are limitless, but I purchased, a number of years ago, what is probably the largest collection of Walpole pieces assembled (I have over 50, maybe more, it has been awhile since I counted). Many of the unique styles and images I utilized in my book, As it was… and still is… Walpole, New Hampshire, and now enjoy in my home. But it is time to share what I have. Eventually I will illustrate all, but below is a sample. Prices start at $25 each. Here is a small sample.